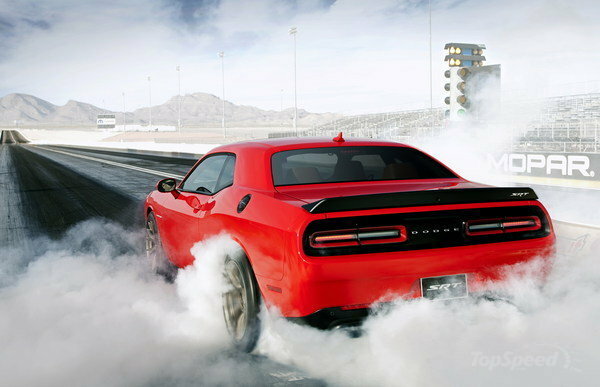 Yesterday, Dodge released more information on the highly anticipated Challenger Hellcat model, which will officially be released next week on 7/7/2014. It turns out that the new supercharged 6.2 liter V-8 will fire out a walloping 707 horsepower and 650 lb/ft of torque. That makes the new Hellcat the most powerful American production car EVER built, beating out other contenders like the Shelby GT500 by 45 horsepower and the Camaro ZL1 by 127 horsepower. 1. 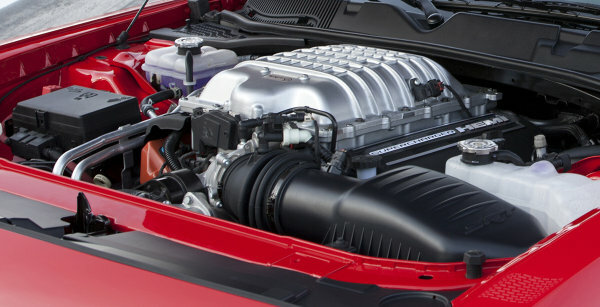 The Hellcat is using a de-stroked version of the 6.4-liter Hemi. 2. The supercharged 6.2 liter engine incorporates a forged steel crank with hardened bearing surfaces. It also utilizes forged pistons and powdered forged rods with beefier bushings and carbon coated pins. 3. The engine features an IHI screw-type supercharger, which is kept cool by dual water-to-air intercoolers. All of this helps to deliver extra boost to the vehicle. 4. Depending on the vehicle, a Tremec TR6060 six-speed manual or a TorqueFlite eight-speed automatic helps to channel power to the rear wheels through the latest model driveshaft, axles, and additionally cooled rear differential. 5. The vehicle’s exhaust features electronic valves that open up, which helps facilitate sound and helps exhaust gases exit. 6. The engine’s heat-treated aluminum heads are made of an industry premier, higher grade alloy. This alloy helps the engine under the hard thermal cycling that the 700 plus horsepower engine delivers. It is rumored that the car will go for a little more than $40,000, which is a far cry from the affordable prices of your Granddaddy’s muscle car generation. But whatever, let’s not let money ruin the latest eye candy coming from Dodge. This entry was posted in Dodge and tagged dodge, hellcat, most powerful ever, muscle car. Bookmark the permalink.